Blessings with Selene. 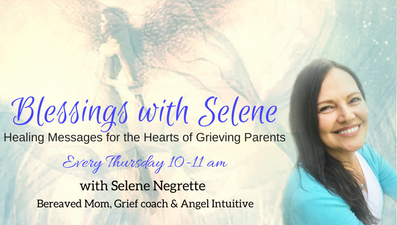 Weekly Thursdays 10-11 a.m.
Selene is a grief coach and Angel Intuitive who after experiencing the personal loss of a child, restored her life by receiving and accepting loving messages from spirit. She brings her guidance, experiences, and spiritual approach to those parents who are grieving and strives to help them nurture their connection to their child, to God and to the angelic realm. She is the author of: “Not Your Usual Grief Book: How to Heal While Connecting with Your Child Who Died,” in the hopes of spreading her message of healing and love to all those who need it. Topic: Selene will be discussing a powerful tool that can help grieving parents set a positive tone for each day as well as the importance of self-reflection in the healing process.